Born in 1895, Frank Pacey was the son of Frances Anne and William Pacey. Frank was third of child of five sons (Frederick b. 1891; Charles b.1893; William b.1898; James b.1903 and Albert b.1905) and one daughter (Sarah b.1896). The family moved to Easthorpe in the early 1900s where William Pacey ran a ‘plumbing, gas-fitting and sanitary engineering’ business. On leaving school Frank was apprenticed in the family firm as a plumber. Noted for his proficiency in that trade he was by all accounts popular with customers. His intention was to rejoin the family firm on the cessation of the war. In the first decade of the 1900s William Pacey’s business was a growing concern. Frank’s two older brothers were qualified plumbers and one of his younger brothers, William, was an plumber’s assistant. In 1911 Charles emigrated to Canada with his boyhood friend Arthur Gilding. They took up the call agricultural labour in the western provinces eventually to find employment in Saskatchewan. Such a decision may well have appeared to set Charles’s life on a different course to that of his brothers. That was not to be the case. The outbreak of war in 1914 brought Charles back to Europe with the Canadian Expeditionary Force and for a short period his, Frank’s and William’s lives would once more follow a common course. The Leicestershire Territorials were mobilised on the outbreak of war. Frank Pacey, age 19, was a territorial with the 1/5th Battalion who were mustered at Loughborough between the 5th-11th August 1914. Territorial soldiers were not obliged to serve abroad. However, many volunteered for front line action within days of the declaration of war. Frank had a decision to make. Should he volunteer? He wrote home from Luton, where the 1/5th Leicesters were sent for training, to his father seeking his father’s guidance. He is clearly set on extending the terms of his service but shows due deference to the views of his father as to whether he would be in agreement. C Coy. 5th Battalion Leicesters Regt. By the ‘17th August the question was put more definitely, the percentage of those willing to extend the terms of their service was estimated at 90 per cent.’ (J.D.Hills, 1919, The Fifth Leicestershire 1914-1919). Frank was amongst them. We do not know if his father replied yes or no before he attested, nor whether he made it home ‘to get things together a bit’.’No detailed records of Frank’s service survive. The next six months were spent in preparation for their front line service. They arrived in France at Le Havre on the 28th February 1915 and were transferred to Armentieres to gain front line experience with regular army battalions. The reality of front line service made its immediate mark. Each platoon spent 24 hours in the line with a platoon either of the Essex Regt., King’s Own or Lancashire Fusiliers, who were holding the sector from “Plugstreet” to Le Touquet Station. It was a quiet sector except for rifle fire at night, and it was very bad luck that during our first few hours in trenches we lost 2nd Lieut. G. Aked, who was killed by a stray bullet in the front line. (P. 21 J.D.Hills, 1919). I received the journal (Grantham Journal) & letter alright today. We get paid 5 francs a week but can’t spend it as we keep shifting from one place to another & there are only villages with no shops, so I don’t want any money, but I should like a few fags & a small cake for we can’t get anything like that here. We are staying in barns, & it is rather cold outside with a few inches of snow, not a bit like sunny France. I see in the Journal that C. Calcraft has been within the sound of guns. If he doesn’t get any nearer I don’t think he will hurt. So Charlie has landed in England. Tell him to enjoy himself there while he has the chance. There was a lot of Canadians at our last place & are a lot of fine chaps. Well, I am still keeping well hoping you are the same. The reality of war was to prove very different to his territorial experience. Frank served fourteen months in northern France without the benefit of home leave, even after injury in July 1915. His family would never saw him again. Between the lines of brief letters home veiled versions of Frank’s experience can be sighted. I regret to have to inform you that a report has this day been received from the War Office to the effect that No. 1895, Private F. Pacey was admitted to No. 10 General Hospital, Rouen, on the 27/7/15 suffering from Shock. At 6-55 p.m., having vacated “A1” for the time, we blew the smaller of the two mines-in order, it was said, to attract as many of the enemy as possible into his redoubt. To judge by the volume of rifle fire which came from his lines, this part of the programme was successful, but we did not have long to think about it, for at 7 p.m. the 1500 lbs. went off, and the Boche redoubt, sandbags, and occupants went into the air, together with some tons of the salient, much of which fell into our trenches. A minute later our Artillery opened their bombardment, and for the next half hour the enemy must have had a thoroughly bad time in every way. Just to let you know that I am a still at or Base. We are having a fine time down here & are able to go into Rouen twice a week. It is a fine city. Well, I am getting about right again now, & expect shall have to go up again in a week or two. I hear the 5th Leicesters have been in for it again & I wonder if Len is still alright. I wrote to him about a week ago but haven’t heard from him since. We don’t seem to get any letters at all though down here. Well I think this is about all this time hoping you at home are all keeping well. Frank was correct in surmising that he would soon return to active service. Less than two weeks later on the 23rd August he wrote home to let them know that he was ‘(p)leased to say I am feeling alright again now’ and that he had been assigned to an entrenching battalion prior to rejoining the 1/5th Leicesters. He also added ‘we are not overworked & get good grub’. He was also correct about the continuing bombardment of his comrades at the front. During the first three weeks of June the Battalion rotated in and out of the front line at Maple Copse near Zillebeke in the Ypres salient. They continued to suffer further casualties. His friend from home ‘Len’ Barrand, who served in the same battalion as Frank, had so far escaped injury. However, his luck would not last. Pte. Walter Miller another local soldier serving with the 1/5th recorded in his diary for 2nd September 1915 that three local residents serving with the 5th Battalion were wounded – Billy Christmas, Arthur Geeson and Leonard Barrand (Please see Walter Miller’s WW1 Diary for further details). Frank was back with his battalion by that date. In a letter written to his brother Charles he reported that ‘Len Barrand very nearly got done the other day. He laid his coat and things down at the side of him while doing a little digging & they threw a hand grenade, it smashed everything up, his water bottle was riddled with holes’. These were not severe injuries. Sadly, soon after, in October 1915, Leornard Barrand was severely injured and was invalided home. He never fully recovered and died in 1919 age the early age of 25 years. Frank’s brother Charles was in touch with the family during Frank’s time at Rouen. He wrote home to his father on the 14th August that he was in the Armentieres sector and that he had intended to see Frank. Frank’s injury must have interrupted that arrangement. We do not know whether the brothers were successful in meeting up. The months to Christmas 1915 saw the 1/5th Leicesters in a series of engagements in which Frank Pacey would have participated. For example, he would have been involved with the attempt by the 46th North Midland Division to take the heavily defended Hohenzollern Redoubt, between 1st October to 15th October 1915, as part of the final stage of the Battle of Loos. This whole action failed and the 1/5th Leicesters took a significant number of casualties: ‘4 officers killed and 6 wounded, losses in the ranks included 19 killed, 132 wounded, 3 missing, 3 died of wounds, 10 wounded and missing, 22 gassed – a total of 199 men’. Other divisional battalions took even greater losses. Frank had survived presumably without injury. Frank’s final letter home written on Saturday 20th November 1915 asked his father ‘H)ow much longer do you think the war will last? I reckon about a month after Christmas will see it over.’ He gave no reason for his estimate. He was looking forward to returning to work with the family business – ‘I know we shall be just as busy after this rotten job is finished, as we used to be.’ Another three years passed before the declaration of the Armistice in November 1918. After further front line duty near Armentieres they were order to proceed to Marseilles for transfer to Egypt. After the mud of Flanders Frank would experience the relative luxury and warmth of Marseilles.They embarked on the 20th December onboard the H.M.T. “Andania”, late Cunard, described by J.D. Hill ‘as a floating palace, fitted with every modern luxury’. It was not to be. Two days later prior to sailing their orders were rescinded. They proceeded back to cold of northern France where Frank spent the last few months of his life in and out of front line trenches on the Vimy Ridge north west of Arras. Frank moved into the trenches on the 14th April 1916 for what was to be his final tour of duty. The area they took over had been heavily damaged by recent exploded mines and required much repair work. On the 20th April 1916 the Battalion was in reserve at Talus des Zouves. Whilst in reserve they provided entrenching parties. The Battalion War Diary records that ‘A’ Coy (company) worked ‘in two reliefs on Trench 123 now named WORTLEY AVENUE. 9 am – 1 pm. 1 pm – 5 pm . Casualties: 2nd Lieut. C.H. Pickworth & 1 man wounded.’ Frank Pacey was that man. 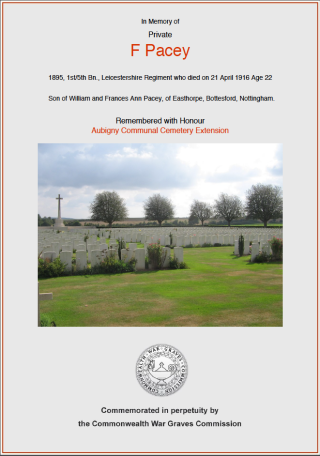 The Grantham Journal for the 13th May 1916 reported the circumstances of his loss in further detail and included the content of a letter to his family from Billy Christmas, a sergeant with the battalion who was ‘an old pal’ from Bottesford. Dear Mr. And Mrs. Pacey, I regret to have to tell you that while on a digging party on the morning of the 20th April, Frank was wounded, but hope it is not so serious as was first thought. One of our corporals saw him some time later being taken from the dressing-station to the clearing-station, and he was quite cheerful and comfortable. The Corporal inquired of the Red Cross how he was, and they told him he (Frank) was about the same. It will be a great consolation to you to know that when he was hit he had fetched some water for some fellows who had been buried through the explosion of a mine under our trench, and while he is away he will be greatly missed by officers and men of the platoon. I expect you will be hearing from the War Office before many days are passed, and also from the platoon officer. I hope by the time you get his letter that Frank is on the way for recovery. From an old pal, Billy Christmas. Unfortunately such hope was not destined to be fulfilled, as Pte. Pacey died from his injury on the day the letter was written. Mr William Pacey has another son serving with the Canadians in France and a third in training at Chatham. The deceased soldier, who would have been twenty-two years of age in July next, had been with the Leicesters serving ever since the outbreak of war and had been abroad for about fourteen months. Sadly the Pacey family suffered a double bereavement in 1916. Charles was killed in action with the 8th Battalion the Canadian Expeditionary Force on the 2nd December near Mount Sorrel in the south of the Ypres salient, eight months after Frank’s death. 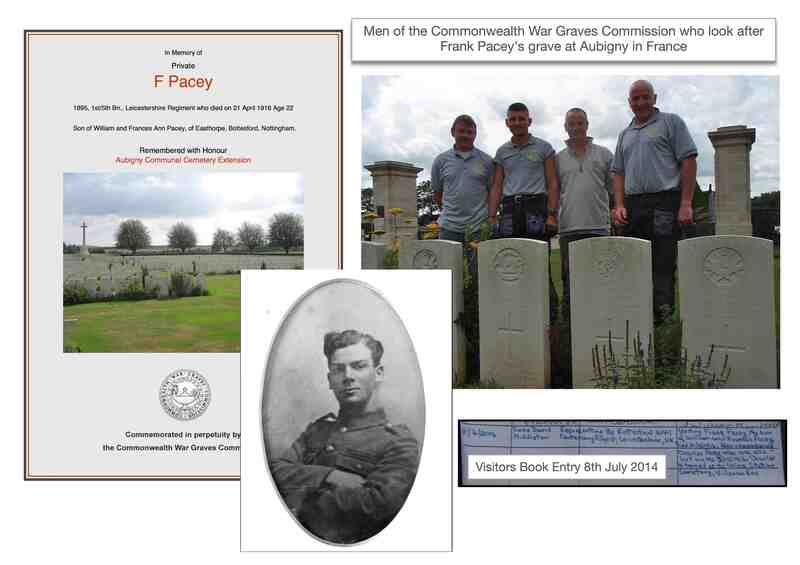 William Pacey, the youngest from the family to serve, survived the war. 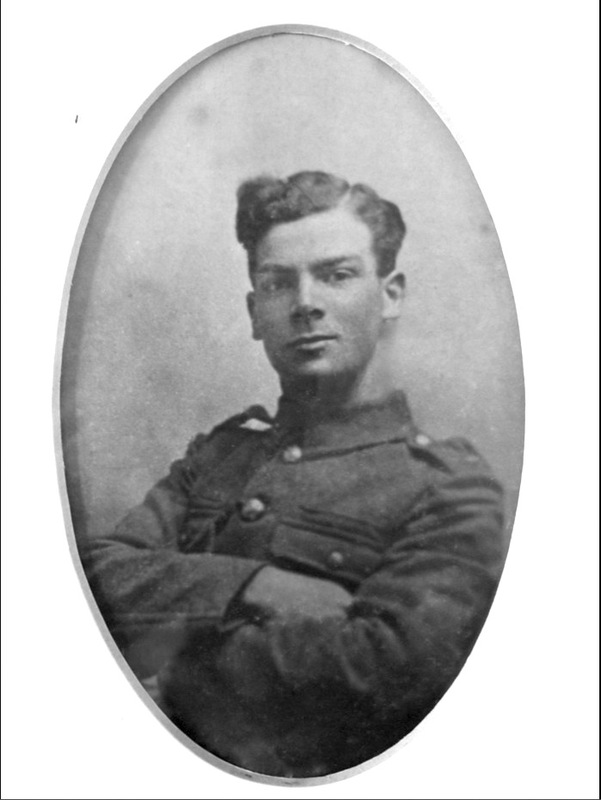 Billy Christmas learned of Frank’s death on the receipt of news from home after returning from further front line duty. He immediately wrote to Frank’s father on the 25th May 1915 to express his condolences and to let the family know that he was actively ‘trying to find poor Frank’s grave but could not, but will try until I do’. 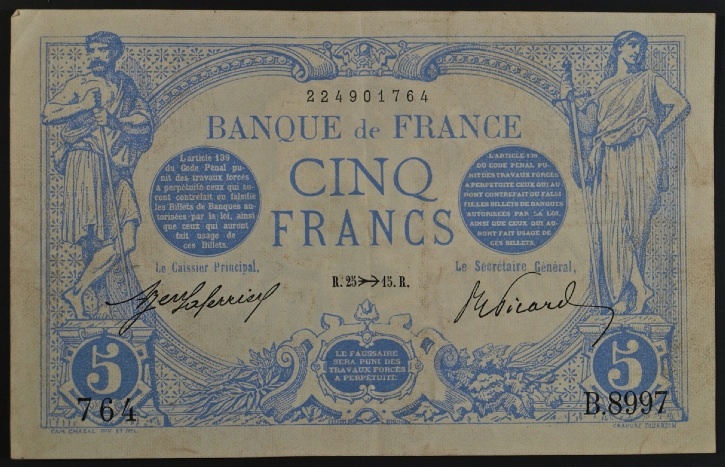 He also enclosed a five franc note given to him by the stretcher bearer retrieved from Frank’s trousers tending his wounds. Frank’s weekly pay as a front line soldier. 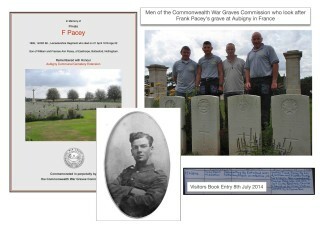 Frank Pacey is buried at the Aubigny Communal Cemetery Extension a few miles to the west from where he was fatally injured.